﻿ 12 Expert Tips for Getting Started on Social Media » Red Mango Marketing! Want to get started on social media but aren’t sure how? We caught up with a few social media experts – people who truly live and breathe social media day in and day out – to get their tips on how to get started on social media. We asked business owners, marketers, social media experts, influencers, bloggers, entrepreneurs, and more to share their secrets for social media success. Many of them echoed similar themes, such as authenticity and focusing your efforts. All of them shared valuable advice that any business can use when getting started. Still have questions about getting started on social media? We can help! Tweet us @ConstantContact. You can also get going by deciding which social media channels your business should be on. 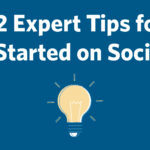 The post 12 Expert Tips for Getting Started on Social Media appeared first on Constant Contact Blogs. This entry was posted on Thursday, April 11th, 2019 at 8:00 am	and is filed under News & Updates, Social Media Marketing. You can follow any responses to this entry through the RSS 2.0 feed. Both comments and pings are currently closed.